Cutting edge technology by Ranco Industries gets under hair stylists feet with the help of MattingExperts.com, Corp. How is it so cutting edge? 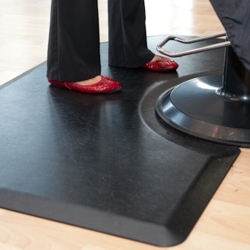 Unlike most hair salon and barber shop floor mats, the foam in Comfort Craft mats is completely encapsulated! Why does that make it so great? The anti-static smooth top and bottom surfaces virtually eliminate the age old problem of cut hair clinging to porous foam and causing a cleaning nightmare. Now available for purchase on MattingExperts.com. For years, stylists and barbers alike have struggled with the appeal of a soft mat to stand on during long work shifts versus the aversion to a hair-filled monstrosity underfoot. Rhino salon mats' new breakthrough design utilizes a polyurethane inner cushion that is entirely protected from outside elements by what they call an “Integral Skin”. The sponge cushion of this mat has been carefully engineered to strike the best balance between compression and resistance for the user. This is important in order to foster improved circulation and blood flow to the feet, legs and back. Other manufacturers offer soft cushions for salon staff that have not been rigorously tested and developed to the exacting standards that Rhino salon mats have been. Their new anti fatigue Comfort Craft salon mat engages the user’s muscles ever so slightly as they stand on and move around the mat. These micro-movements in muscle groups get blood flow going so the user feels less fatigued from standing. In addition, the polyurethane sponge absorbs and disperses shock easing stress to the user’s joints. Rhino believes in a simple philosophy: increased productivity comes from the salon professional’s comfort. All anti fatigue mats offered by Rhino are proudly made in the USA. Currently there are three sizes available in the new material: 4’ x 5’ Hexagon, 3’ x 5’ Hexagon and 2’ x 3’ Rectangle (this size is typically used by the shampoo bowls but certainly would be beneficial behind the receptionist desk). According to Rhino, more sizes are in the research and development phase and will soon be available for purchase. MattingExperts store was founded by Rocky Stevens, CEO, in 2005. Located in Palos Park, Illinois, a southwest suburb of Chicago, Matting Experts carries mats from over 12 manufacturers. The website features over 200 specialty, anti fatigue, industrial and commercial entrance mats and matting accessories.